Choosing your packaging is a breeze with our sleeve boxes. 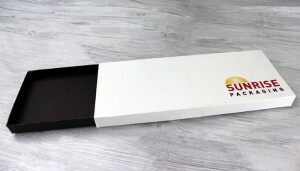 Lightweight and relatively inexpensive compared to its rigid, two-piece brethren, this packaging solution offers the full array of customization options. No need to break the bank on luxury packaging–this cost-effective presentation piece is perfect retail storage for smaller, lighter products. Ideal for thank you cards or even confections, custom sleeve boxes give you free reign to personalize your packaging the way your product deserves. Your Logo Will Shine. Your Visuals Will Pop. The outside wrap is affordable SBS paperboard, able to display custom graphic designs with rich 4-color printing or silk screening. Paperboard is ideal for a high-definition transfer of your original artwork, meaning your product packaging will stand out against the competition. Or opt for unique textures and patterns. The cool on-and-off glide of the outside sleeve will make your product’s presentation a memorable reveal. Inside a chipboard tray gives your sleeve box stability. The sturdy structure of the interior box can hold a variety of products. Lined bottoms and wrapped walls will round out the luxury look of your custom sleeve box. Include plastic or paperboard trays, or die cut foam, for securing the contents to a higher degree. 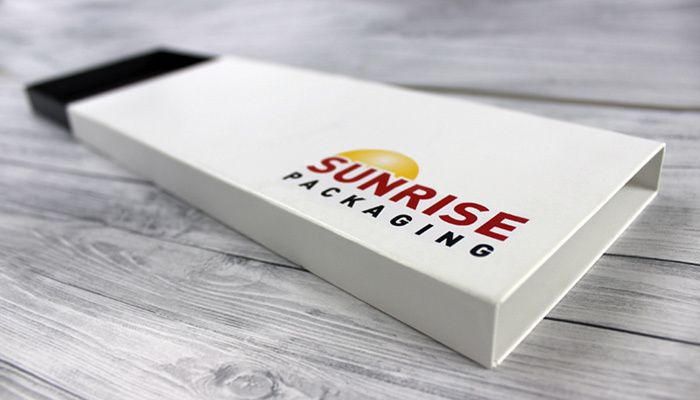 At Sunrise Packaging, we know great advertising starts with great packaging. The first impression counts, no matter the product. Let us show you how any product can be experience the visual, functional boost of luxury packaging. We’ll work with you to create an eye-catching sleeve box that practically jumps off the shelves. Worried your product might be too small or light for a big, bold retail presence? Let us prove you wrong with just the right box for the job. Like the Style But Not the Material? We Can Fix That.